Father Roy Snipes is known for his many animals at Our Lady of Guadalupe in Mission, where he has been leading the congregation for 25 years. Snipes also considers himself a guardian of the La Lomita church along the Rio Grande and opposes a border wall in the area. For nearly 50 years Father Roy Snipes has taken an unconventional approach to delivering God’s message, embodying the outlaw nature of the missionary group he studied under. A common experience at a Sunday mass includes country music, spirited sermons and at least a dozen dogs. 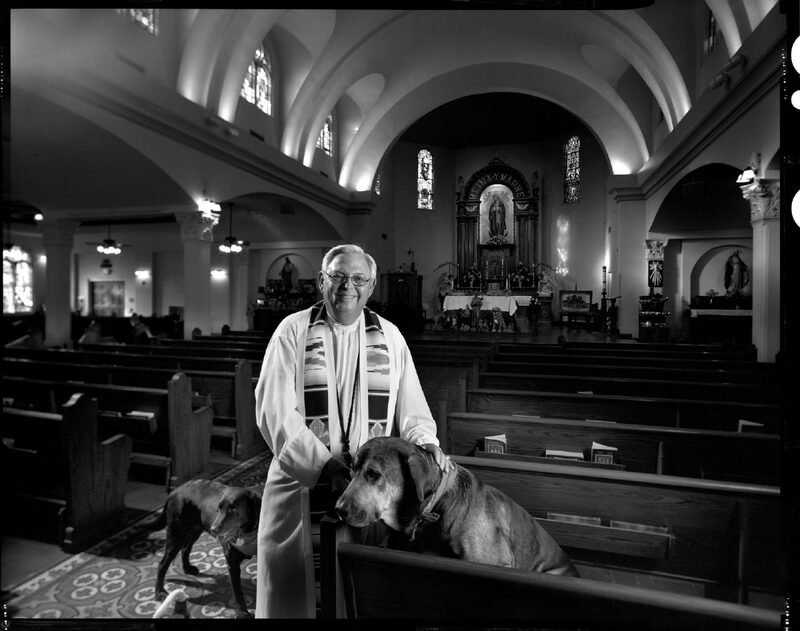 On this Wednesday afternoon in Mission, Roy is surrounded by dogs in his Our Lady of Guadalupe office, just a few feet from the church where hundreds in his congregation gather to hear the message he’s preached for more than 25 years. The 72-year-old priest smiles with a wide grin. His muted blue eyes match his perfectly combed silver hair, as he pets one of the dozen dogs that he’s rarely seen without. “I can’t get ’em to stand still long enough that I can get an accurate count, somewhere around a dozen,” Roy says with a chuckle. Roy is also known as the beer-drinking, country music-loving “Cowboy Priest.” “I think it all helps,” Roy said of his persona, which he hopes is welcoming. He likened his church to a field hospital and not a country club concerned about your status. Roy speaks with a smile in his voice about his time in the Rio Grande Valley, his baritone voice echoing in the small office, filling every inch of the space. He came to the Valley as a 20-something Texas A&M University graduate, an Aggie, looking to teach — just like his mother had — but he found a different path, a different message to pass on. Roy became a priest in 1980, part of the Missionary Oblates of Mary Immaculate, who first established themselves in the Valley more than 150 years ago. Nicknamed the Cavalry of Christ, the Oblate missionaries became the first Catholic clergymen to settle in the Valley — and it’s fitting Roy would be part of a group known for their unconventional approach to spreading God’s message. He believes by making people feel comfortable, feel as though they’re speaking with someone “authentic,” he’s able to share God’s message — that was the mission of the Oblates he says, one he continues to follow. As part of Roy’s efforts to create a down-home environment, in 1992 he secured a couple of acres of land next to the La Lomita Chapel, the mother church to Our Lady of Guadalupe, which is only yards from the Rio Grande. This is where for 25 years Roy has held summer camps for members of his parish. “That was just beautiful, man, we would go there, even in the winter we’d go there pretty often, but in the summer we’re there a lot,” he said of the patch of land next to the old chapel where he hosts summer retreats, among other activities. In a way, Roy says the idea of going down to the river was more about reconnecting, getting back into nature, experiencing something different.